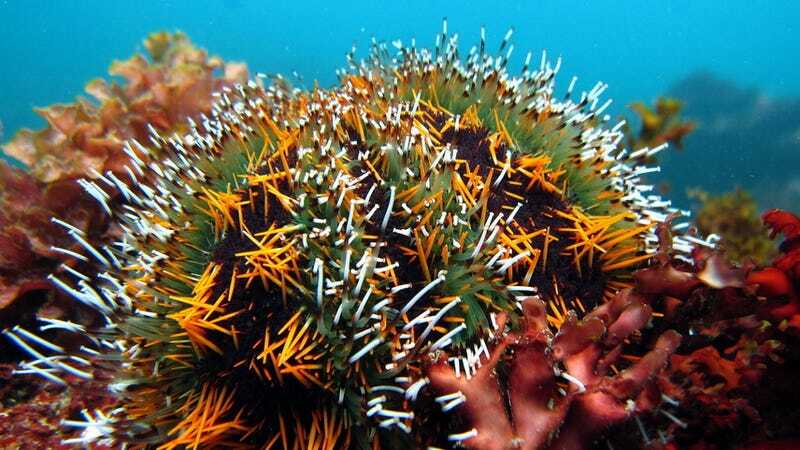 Prey animals are capable of defending themselves in an amazing of ways, but when it comes to mounting a sophisticated biological counter-attack, sea urchins have taken it to another level. When attacked by predatory fish, these humble echinoderms release a hostile cloud of tiny jaws that act independently of the urchin itself, attacking the fish and releasing the venom contained within them. Collector sea urchins, Tripneustes gratilla for the nerds, are found in the waters of the Indo-Pacific, Hawaii, and the Red Sea, and they spend their days scouring the ocean floor for algae and seaweed. These pincushion-like creatures are intimidating based on their appearance alone, featuring ominous spikes that send a clear warning to any would-be predator. But as a new study published in The American Naturalist now shows, there’s more to these spikes than meets the eye. Nestled around the sea urchins’ thorns are hundreds of tiny jaws—called pedicellaria heads—that, when launched from the animal’s body, are still capable of biting and releasing toxins. Dubbed a “waterborne pursuit-deterrent system,” the defensive technique was discovered by marine biologist Hannah Sheppard-Brennand and her team from Australia’s Southern Cross University. Scientists have documented other sorts of projectile defenses in animals before, such as porcupine quills, skunk sprays, and spitting cobra venom, but the independent action of the sea urchin’s pedicellaria heads is rather unique. At first, Sheppard-Brennand thought the tiny pedicellaria were some kind of parasite, but closer examination showed they were indeed a part of the sea urchin itself. Located between the sea urchin’s spikes, these three-jawed, pincer-like heads—some of which contain venom—rest atop tubular stalks. When the sea urchin is attacked, a swarm of them are released to seek out the offending predator (typically a fish), latch on, and release their venom. The researchers observed this behavior in both the field and in laboratory settings. It takes about 40 to 50 days for the sea urchin to re-grow its anti-fish defense, but they only use a small amount of their ammo during an attack. Interestingly, when the researchers offered fish food laced with pedicellaria, they rejected it, suggesting some predators have evolved an aversion to this noxious—and bitey—substance. The discovery adds to our understanding of urchins and how they’re able to achieve high population densities in many reef habitats. Also, nature is terrifying.